There is so much to say about being in Saigon, but I’m spending all my time being taxied around the city looking at apartments and have little time to write. I do have to mention three of our most recent culinary escapades, though, before they fade into my memory. 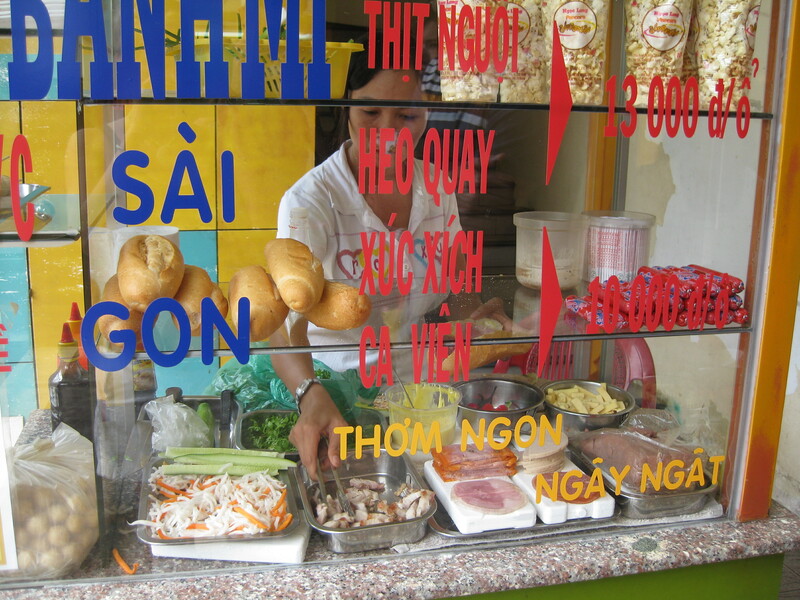 Since we got to Vietnam, I have been asked repeatedly if I’ve had banh mi. I never saw it in Hanoi, so either they don’t have it up there, or I wasn’t looking in the right place. Several of us walked over to the MaxiMark yesterday looking for food. They have a food court, but we didn’t even make it in the door before we saw the banh mi cart. I opted for something that looked like salami and ham cold-cut style and some kind of chopped roasted pork (?). We could have had pate’ and the weird off-white “meat” I see a lot. Once we selected the meats we wanted, and the lady went to work. She used about a nine inch loaf of French bread, sliced it open, spread some yellow stuff on it (butter? ), put a shredded vegetable combination, peppers if we wanted, some kind of white cheese, and sauces and put it in a warmer. After it was warm, she added cilantro and a long chunk of cucumber. When it was done she wrapped it in a square of paper, rubber-banded a toothpick to it, and put it in a little bag. It cost 13,000 VND/$.66, and was delightful. Our next two meals were places our friends took us based on Anthony Bourdain’s show. The first place was Com Nien Sai Gon. When we arrived, the selector seemed disappointed. He had heard about clay pots being broken and rice being thrown, and this place seemed a little posh for such behavior. Looks can be deceiving though. As we sat, discussing the menu, we heard a loud crash and saw a tan object fly across the room like a flying saucer. The waiter on the other side of the room had a plate and made a show of catching the rice, grains flying off everywhere, and flipping it around a few times before placing it in front of the customer. Everyone wanted to order the rice that flies. It’s baked in the clay pot so it has a hard shell around it, kind of like the rice that gets stuck on the bottom of the pan. 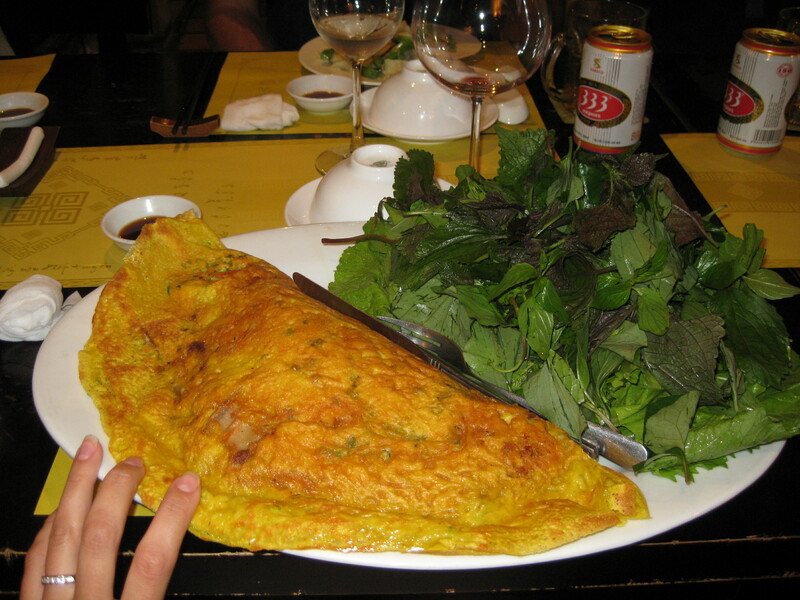 I wanted to branch out a little bit so I tried the Vietnamese pancake. They had a vegetarian option, but the waiter said the regular one was better. I couldn’t really understand his description. I thought I heard powder and assumed he meant flour (it’s a pancake, of course) and he mentioned shrimp and beef. He also said it comes with vegetables next to it and put his hands in an upside-down bowl shape to indicate the size of the side of vegetables. When my plate arrived I couldn’t even keep my mouth closed. From the outside the pancake looked like an omelet, but folded in half it was about the size of my head. The greenery that came with it was the size of a salad we would make at home for eight people. They also brought a side of sauce and a little bowl of peppers (sliced red chilis and whole, tiny green ones.) There was a Vietnamese lady with us who asked me if I had ever eaten a pancake before, and offered to show me how. She stood next to my chair and began fishing around in the pile of leaves with her chopsticks. She pulled out a leaf the size of a man’s hand, found a smaller, different leaf, and then began picking through the herb leaves asking if I liked each one. There was one I didn’t recognize and she told me to taste it first. I’m glad she did because the flavor was not enjoyable to me. After she made a bed in her hand with the leaves, she started tearing open the pancake. It was thin as a crepe, and looked egg-based – if it wasn’t solid egg. There were piles of bean sprouts inside. She tore off part of the pancake, piled on some sprouts, folded it neatly into a roll, handed it to me and instructed me to dip it in the sauce. I did not realize the shrimp still had their shells on, so that was a little bit interesting, but it was tasty. The pancake itself didn’t have as much flavor as I had expected, but with the greens, peppers, and sauce it was a great combination. Along with the shrimp still having their shells, the meat was in flat squares, with a line of fat, from a cut that I couldn’t identify. I wonder if it would have been better vegetarian, and would be curious to taste it from someone’s stall on the street. I know a lot of meals at nice restaurants are tamed down for foreigners. Today, after a morning of apartment viewing, we followed some friends to the lunch lady. I’m not sure how they ever found her the first time (or how Mr. Bourdain did either), because she is down a few little streets in a neighborhood. A few streets come together, and her “shop” is set up on a patch of concrete toward the middle. She makes one dish every day, starts serving at 11am, and goes until it’s gone. It’s different every day, and you eat what you get. We got there around 1pm, and though it wasn’t packed, it was still busy. As we walked up, they unstacked two plastic tables and four little chairs. We were barely sitting when one lady brought a plate with fresh shrimp spring rolls. Another lady was mixing up tiny bowls of sauce for each one of us. Then the lunch lady starting bringing our bowls. I thought the same thing I’ve thought many, many times lately – what have I gotten myself into? I like to know what I’m eating before I put it into my mouth, but here, it’s just not possible. There was something that looked like a dark brown, stewed cucumber (or something that would be floating in something besides soup.) It ended up being a type of eggplant that was surprisingly tasty. I saw pieces of pineapple, what we hope was roasted pork, circles of squid, and green onions. 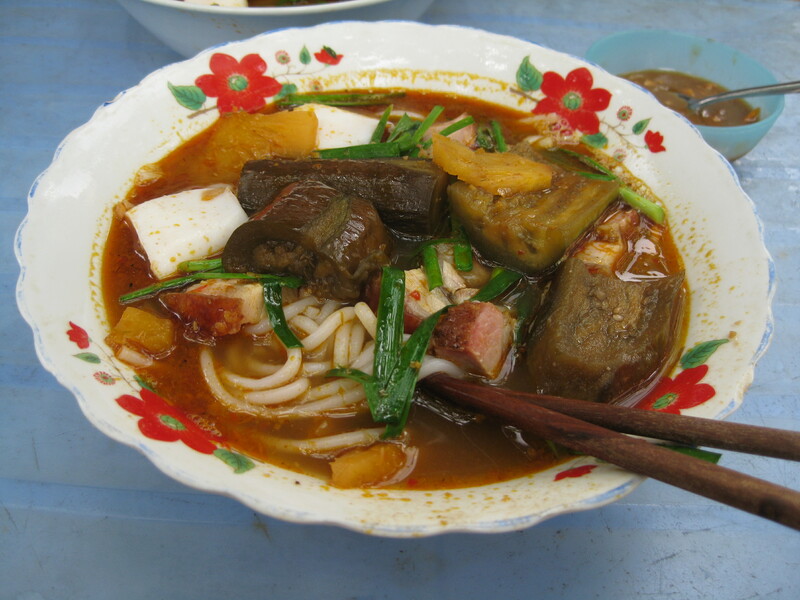 Underneath the top layer of meat and vegetables were the noodles. They were round like spaghetti but much fatter. As I maneuvered them with my chopsticks, I felt like they were alive, flipping, slipping, and slithering off the sticks and back into the bowl. We all ended up with soup splattered in our laps and all over our faces. There were no napkins and no restrooms to wash our hands before or after. We all discussed which ones of our family members could hack eating a meal like this. It was not the prettiest meal I’ve eaten, but it was good and filling. And, oh yeah, it cost a dollar. Grace, you’re eating all of my favorite dishes! Thanks for putting up the pictures! You at Asian Spam? I’ve been here for four years and have managed to avoid it longer than stinky tofu. I’m jealous of the raw veggies. If I want them here I have to prepare myself. It’s easier to buy Alaskan salmon than a decent salad here in Ningbo.